With the help of my male co-teacher, I think I’ve finally found a way to get my son to do his laundry—a major achievement for a boy who can’t seem to work a toilet paper holder. My son, like many others, doesn’t really believe in clean clothing and sees nothing wrong with wearing clothes six or seven times, thank you very much. If you’ve never raised a boy, you won’t necessarily understand what I’ve been up against. Here are a just a few examples of my son’s take on clothing. His statement got me to thinking (after I nearly threw something at him), and now I may just have the whole issue beat.I thought it would be fun to share my discovery with you so that you can hopefully use it with your significant males. 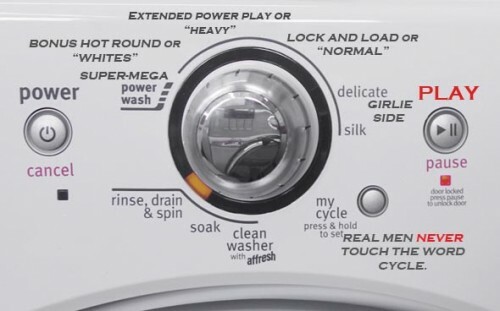 The way a man wants to wash.
Level One: Lock and Load or Normal. Pre load the game by adding dark clothes to the machine and shut the door. This loads them and prepares them for the battle sequence. Next, add one cup of power boosting serum to the slot labeled “detergent.” You get extra lives if you add any type of “laundry booster” or by attacking stains with “pre-treatments.” Extra lives may be important later, so don’t be afraid to gather them here at the beginning. Hit play and watch the game begin. Level Two: Extended Power Play. Congratulations on making it to the second level. This level is much harder and requires more work. First, you need to gather pants, blue jeans, and any badly stained clothes. You must be careful because pre-treatment lives and “laundry booster” points are necessary at this level—you cannot win without them. Make sure you shoot each and every stain before loading. Again, add the power boosting serum to the “detergent” slot and hit play. Level Three: Bonus Hot Round. This is the hardest level and also the nastiest. Brace yourself. This level is for your white clothes (or the ones that used to be white) , the nasty towel in the bathroom, your gym clothes, and the disgusting socks the dog chews on. This level is also known as “whites.” In addition to the power boosting serum, you may also use the one-time power bomb called “bleach” on this level, but only once. Hit play and be prepared. Good luck. They are missing out the joys of doing housework and playing at same time. While machine does the work, sit back and read, watch TV, play games, etc. Just don’t forget doing laundry.